Twisting my husbands arm to raft the Colorado River through the Grand Canyon was a 2 year sway job until our time slot was upon us. I knew I would love the canyon, period. I had spent my senior year in high school in Tucson and fell in love with the desert. It’s broadness, it’s moodiness, it’s snappy dry beauty mesmerized me. To my husband, it was a land of ROCKS! Just ROCKS! His thought was once you’ve seen one you’ve seen them all. And 16 days of seeing the “same” rocks, in the dry barren desert, was the last thing he wanted to spend our 20th anniversary doing. His only spark of interest was the rapids. Surely though, these pockets of excitement would be too few and too far between for 16 days. The accountant in him was sure to point out that 16 days meant 384 hours and 23,040 minutes. I worried for my husbands enjoyment but not for mine. Still on our anniversary I would like it to be mutually rewarding. Doubts snuck in about his ability to find something he could love about it, but, we were booked and had already paid up so it was too late to back out now. I have to say, I would have still gone, this was a bucket list trip and I would make it up to him later somehow if he didn’t like it. Everyone who hasn’t been yet thinks they have a pretty good idea what awaits them here. I know I did. My husband thought he did too. Well it was some of that, but mostly it was none of that. The rapids did NOT disappoint. They were exciting, fun, chilly, adrenaline pumping and sometimes a real challenge. The camp, the staff, the food they prepared and their professionalism, again, were expected and more than expected. A pampered but rugged vacation. I guess it’s known as glamping now. What got us, what got me, and what really got my husband, was the sheer diversity and beauty every river bend, cliff edge, rock face and variety of hikes we were surrounded by the entire 16 days. Surprising amounts of springs and waterfalls, wildflowers and greenery were found on the rivers edge and along the many hikes taking us to vistas that left our river side camp and dories look like water bugs floating in rain puddles. Surprised by the multiple varieties of green in what we assumed would be a starkly dry and barren land helped us realize how much life is here. Tucked up some long narrow canyon toward the trickling headwaters were ferns and lushness like found in our North Carolina rain forest. Granted the size of these oasis’ were much smaller and isolated they were none the less full of verdant enchantment. Gnomes and fairies could easily flit and fly through underground caverns from one oasis to another. 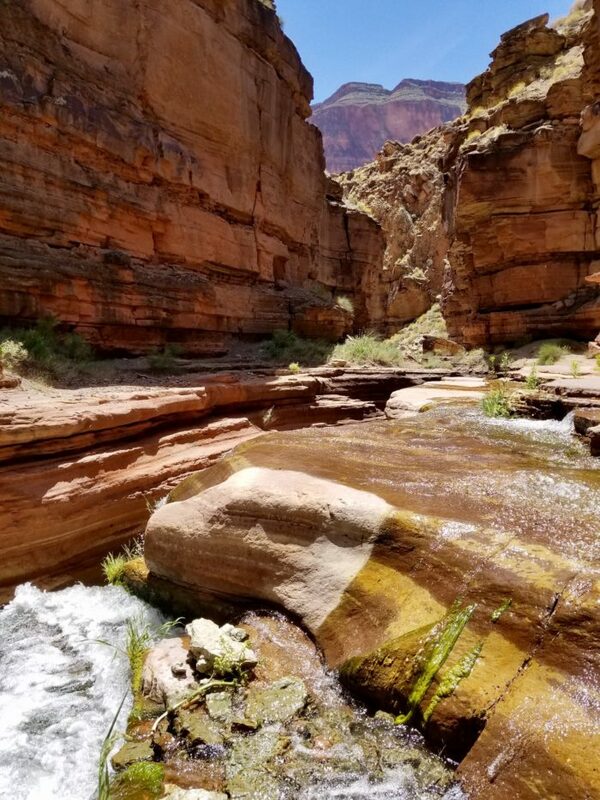 To hike a recently washed in river bed which had been placed there by the sheer force of water volume during thunderstorms and flash floods was almost incomprehensible. That it started with that tiny minuscule crystal blue trickle a few thousand feet up into the narrowing canyon seemed nearly impossible. Many of our guides were veterans of these places so they could truly relay the vast difference in a canyon they had hiked for years that had now been transformed into a rubble construction-looking road bed, barely nature made created at all. They also knew, because they had seen it many times before, nature would repair from this rearrangement and create another new oasis. Something worth coming for and checking on from raft trip to raft trip, year to year. I wasn’t expecting to love the hikes, at least not as much as the river rapids but my new confidence hiking 6” wide cliff hugging trails and the happy exhaustion and rewarding scenery the word love now totally applies. My husband, well, he wasn’t expecting much at all but he is a convert now. It didn’t take 16 days for him to convert, it took 2. So we came home, high from our adventure, and higher because it was such a wonderful discovery we found together. After having a few hot showers and a temperature controlled room for a short spell we are ready to go again. Raft on!! !